Morrisons offers an extensive range of produce, whatever you need, you will find it in Morrisons. Not only does the store have a wide range of food and drink available, but it also has a Pharmacist, a bakery, a meat and fish counter as well as a vast selection of household items and toiletries. I used to do the majority of my shopping at Morrisons but I loathe the new store and avoid it if possible. Although the fruit and veg department looks impressive it’s been given way to much space at the expense of the grocery aisles – I’ve heard 4 customers complain about the width of the aisles. I’m sure there are some cooks who are in their element with the extreme range of produce available but I’m sure the majority of customers have never heard of or can afford such items. The variety of everyday groceries seem quite limited but maybe it just appears that way due to the size of the store. Good points – the staff are still as friendly and helpful as ever, meat and veg still the best and I’m glad self service checkouts have been installed. 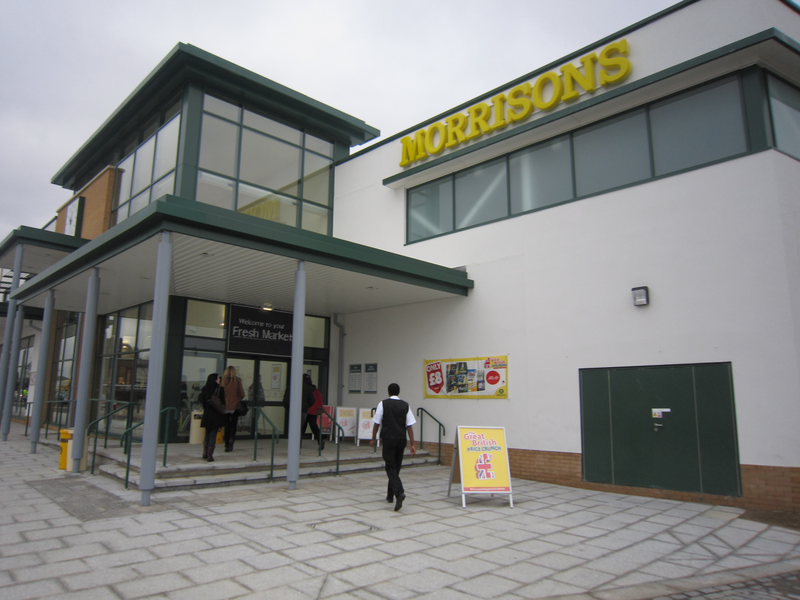 Looking forward to the new, and much needed, Morrisons opening in the near future. Cannot understand those who are resistant to change, is it an age thing? Agree with Nicky; RIP Hadleigh (and all it’s privately owned shops), welcome to MorrisonsTown. Pity that they have decided (and the council have agreed) to build a HUGE Morrisons in a small town where the one we have is just perfect. I cannot understand those, mainly elderly, people who are whining on about the new Morrisons and the Re-generation. OK so you’re lived here for a long time, that doesn’t give you the right to try and obstruct something the majority of people want. If you cannot cope with change find somewhere else to live, somewhere that is as boring as you are. This a really good store. Just a mile from home it is so easy to go by bike. It would be better still if I could safely get in to the car park by the exit road. Even the pedestrians have a challenge. But the quality, prices and friendly staff draw you back nearly every day. The new store looks huge, dwarfing everything around. Lets hope it looks better when it’s finished. Worried about the car park exit. Should be back to a roundabout on the London Road.